Hyperthermia has a number of biological effects that sensitize tumors to radiotherapy in the range between 40-44 °C. 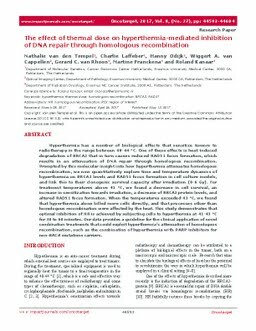 One of these effects is heat-induced degradation of BRCA2 that in turn causes reduced RAD51 focus formation, which results in an attenuation of DNA repair through homologous recombination. Prompted by this molecular insight into how hyperthermia attenuates homologous recombination, we now quantitatively explore time and temperature dynamics of hyperthermia on BRCA2 levels and RAD51 focus formation in cell culture models, and link this to their clonogenic survival capacity after irradiation (0-6 Gy). For treatment temperatures above 41 °C, we found a decrease in cell survival, an increase in sensitization towards irradiation, a decrease of BRCA2 protein levels, and altered RAD51 focus formation. When the temperatures exceeded 43 °C, we found that hyperthermia alone killed more cells directly, and that processes other than homologous recombination were affected by the heat. This study demonstrates that optimal inhibition of HR is achieved by subjecting cells to hyperthermia at 41-43 °C for 30 to 60 minutes. Our data provides a guideline for the clinical application of novel combination treatments that could exploit hyperthermia's attenuation of homologous recombination, such as the combination of hyperthermia with PARP-inhibitors for non-BRCA mutations carriers.